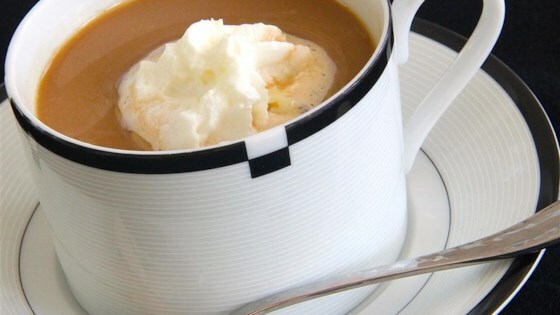 "I created this coffee drink out of a craving for a little kick to my coffee. Based on my love of hot chai, I began to feel that North Americans have a distinct lack of health-giving herbs and spices in our native cuisine. Hopefully a delicious hot cup of Viennexican can assist. Thinking of the spiciness of Viennese coffees and of the chocolate and fruit flavors of South American beverages, I believe the combination makes a beautiful result for the taste buds and the system as a whole!" Stir coffee, milk, cream, brown sugar, cocoa powder, vanilla extract, orange extract, cinnamon, cloves, and nutmeg together in a large mug until smooth. You can substitute molasses to taste for the brown sugar. If this recipe seems too rich, feel free to substitute skim milk for both the milk and the cream. Alternative milks (rice, almond) should yield a creaminess that is equally enjoyable. If you do experiment in finding the best brew for you, please share your process with the rest of us in the reviews.